The previous page contained an overview of anchors. This page discusses various types of anchors. Single-point anchors are probably the most common type of anchor. They only require a single strong anchoring point and can be tied quickly. Commercial anchor straps are manufactured with D-Rings pre-sewn into both ends. They are popular in urban and industrial rescue because they can be attached quickly without tying a knot. The single-purpose use of anchor straps make them less popular in backcountry rescue. A single loop of webbing, or cord, is also a popular anchoring technique. The loop is typically creating by tying a water knot when using webbing or a bowline when using cord. 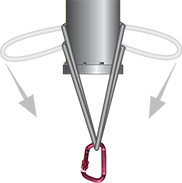 The advantages of single-loop anchors are they can be created from standard materials (i.e., cord or webbing) and they require less material than most single-point anchors (e.g., a basket or girth hitch). A disadvantage of single loop anchors is that, unlike wrap-3-pull-2 and girth hitch anchors, they don't cinch onto the anchor and might slide up or down. 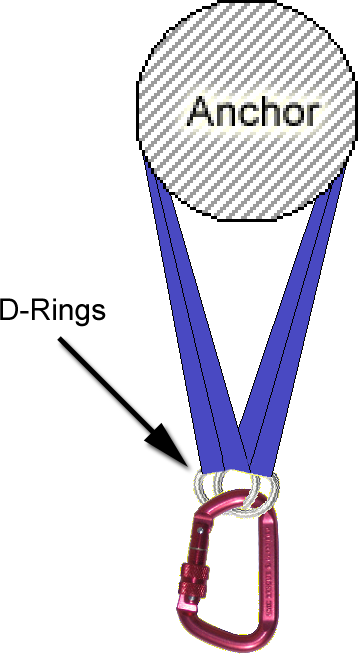 Another small disadvantage is the knot must be tied after the rope is wrapped around the object. 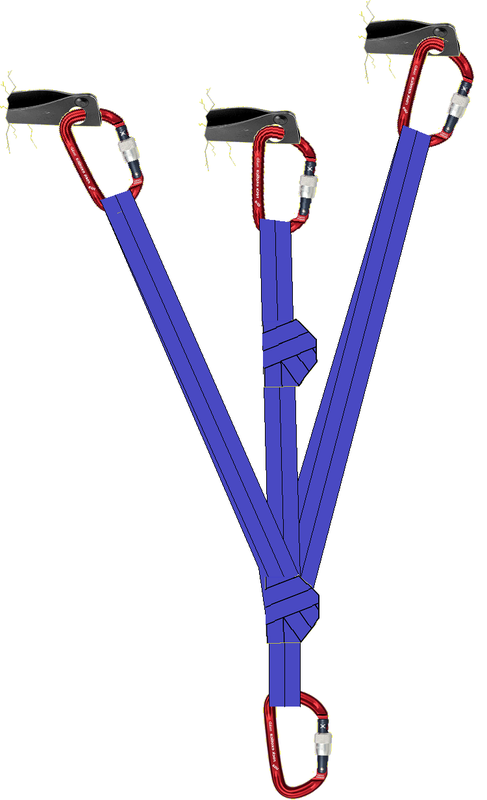 Wrap-3-pull-2 anchors (and wrap-2-pull-1 anchors) are created by wrapping rope or webbing around an object multiple times and then connecting a carabiner to all but one of the strands of rope. 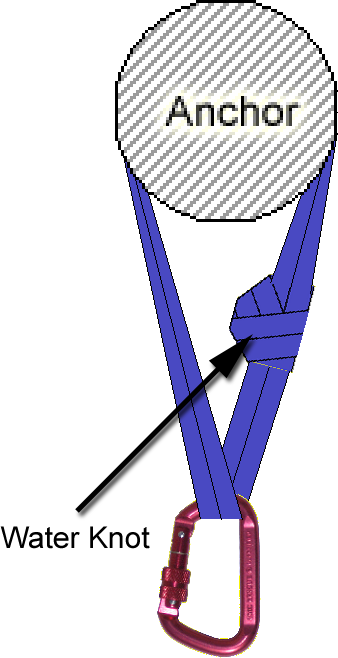 Most rescuers place the knot against the anchored object, the concept being that by positioning the knot against the anchored object the stresses on the knot will be reduced due to the object's friction. It's a good theory, but in reality the weakest point will be where the carabiner connects to the rope. If you think the knot is creating a safety hazard, you should find another way to strength the anchor. A basket hitch is created by wrapping a pre-tied (or sewn) loop around an object. Advantages of basket hitch anchors are they can be created from standard materials, they can be pre-tied and attached to an object quickly, and, because they have four strands, they are especially strong. Basket hitch anchors have three potential disadvantages. 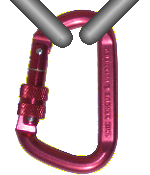 The first and most important is that, depending on the length of the loop and the diameter of the anchor the hitch is tied around, it is possible to triaxially load the carabiner. Also, as with single loop anchors, basket hitch anchors don't cinch onto the anchor and might slide up or down the anchor. And although almost always a non-issue, basket hitch anchors do require a little more material (e.g., webbing) to create. A girth hitch anchor is created by wrapping a pre-tied (or sewn) loop around an object and then passing one end of the loop through the other end—creating a girth hitch around the object. As with basket hitch anchors, girth hitch anchors can be pre-tied using standard materials and assembled quickly. 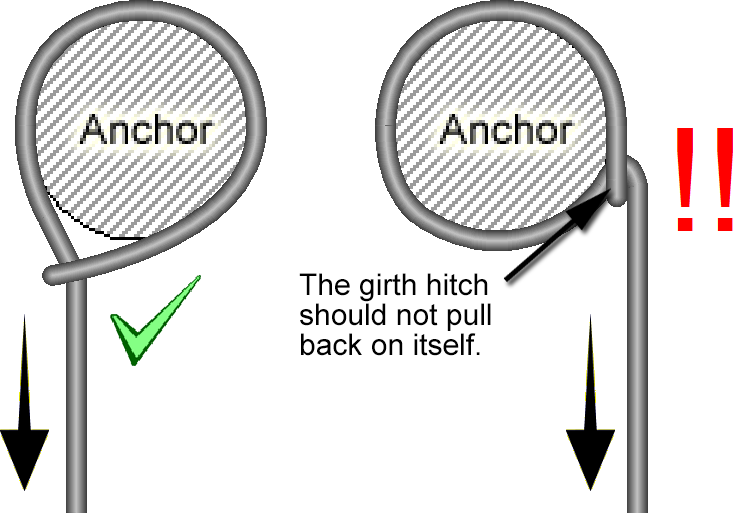 A disadvantage of girth hitch anchors is that if they are positioned incorrectly on the object (see illustration), they can create 2:1 leverage on the "hitch" which could cause the nylon-on-nylon to fail. This is easy to resolve with proper positioning, but it must be consciously recognized by the rescuers. 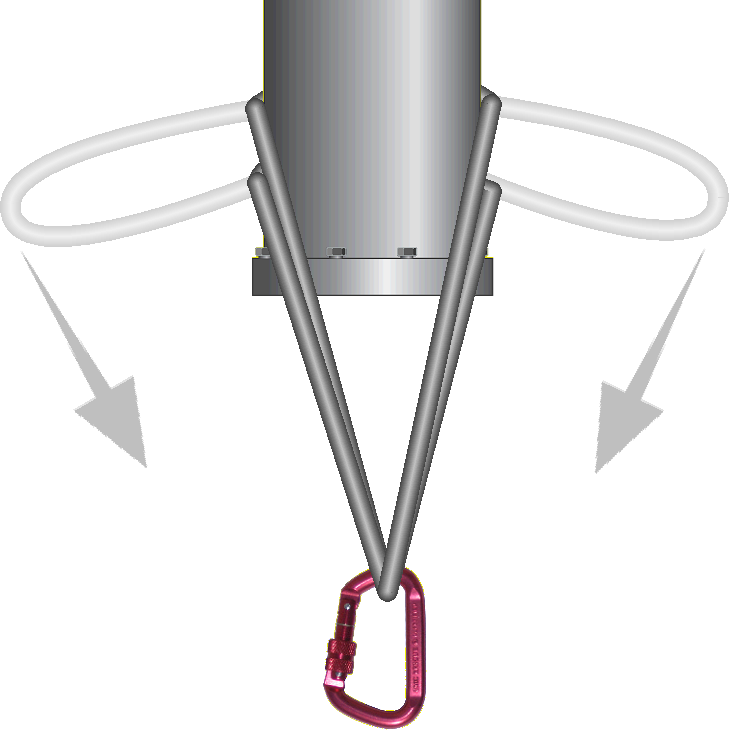 Multi-point anchors are created, as the name implies, by connecting multiple objects. Multi-point anchors are necessary when existing objects don't line up with the direction of pull or when the individual objects that you are attaching to are not strong enough on their own. Multi-point anchors have two disadvantages. First, and obviously, they require more time and material to build. Secondly, when tied incorrectly the angle of the ropes connecting to the anchors can create more force on the anchors than the load itself. You can learn about the force-multiplying effects of rope angles. Multi-point anchors are helpful when the available anchors don't line-up with the desired direction of pull. 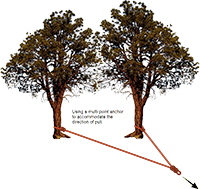 In the illustration shown here (you can click on any of these illustrations to enlarge them), two trees were used to position the "focal point" (the figure 8 knot) inline-with the direction of pull. You can build a multi-point anchor to create a stronger anchor. Granted, it is preferable to build an anchor by connecting to one bomber object, but if that isn't possible a multi-point anchor is appropriate. And many teams use multi-point anchors for redundancy regardless of the anchor's strength. 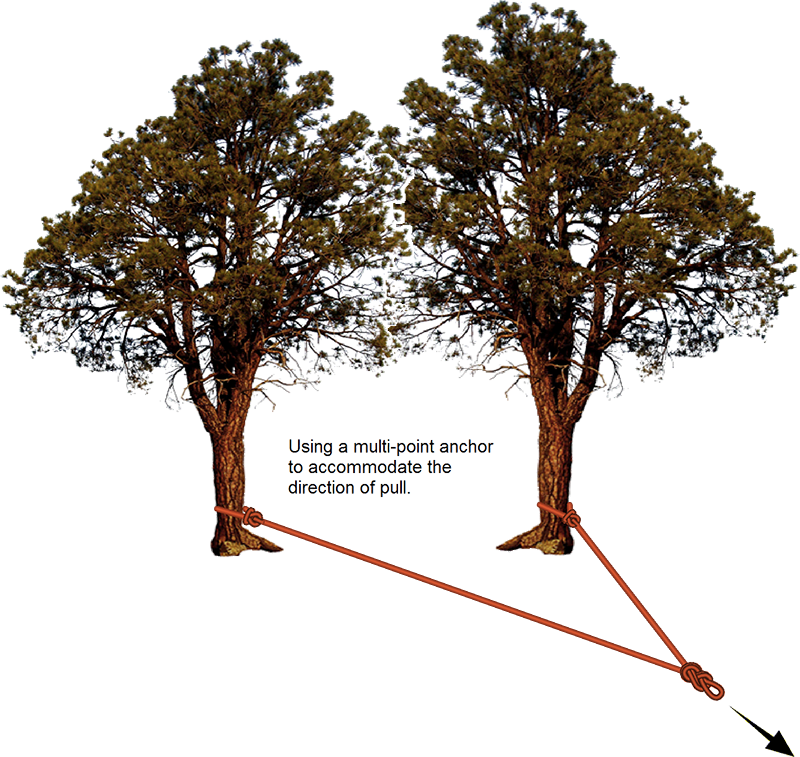 If you build a multi-point anchor because the individual objects aren't as strong as you would like, it is important to consider what would happen if one of the anchors failed. Specifically, if one of the anchors fails it should not be possible for the rope to unthread from the remaining objects and drop the load. 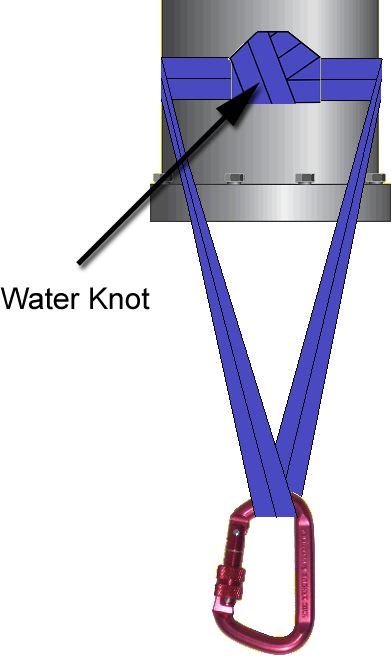 Similarly, the failure of one anchor should not induce a significant amount of slack into the system (i.e., to "extend") which would result in a shock load on the remaining anchors. The piton anchor shown here addresses both of those concerns.